Everyone loves movie night! 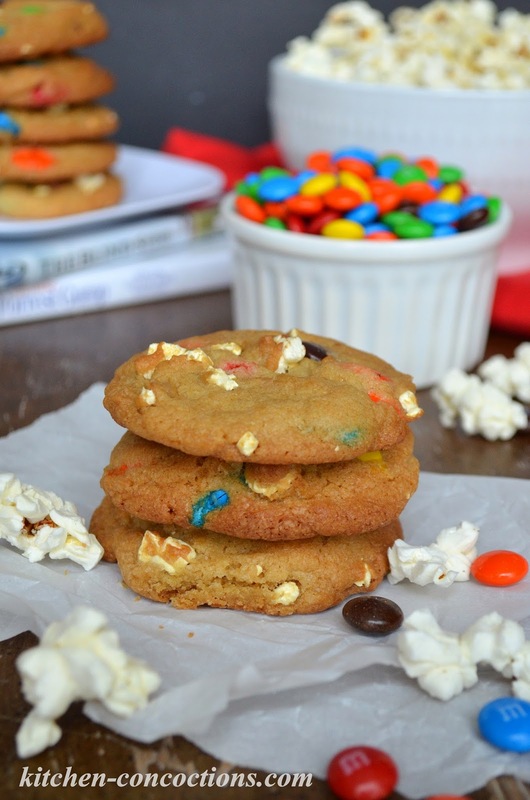 Give the gift of movie night this holiday season with a homemade movie night gift pack filled with fun movies, popcorn, candy and buttery, crispy Movie Night Popcorn & M&M’s® Cookies! I have shared many times that I absolutely love having movie night at home. Yeah as much as it is fun to get dressed up and have date night out, cuddling up on your couch in comfy pajamas, eating whatever snacks you want and being able to pause the movie for any unexpected interruptions, well, that is simply perfect. Since I love everything about watching movies, the snacks (a soda, popcorn and M&M’s® are my personal favorite), eating popcorn out of a special container, the entertaining movie and just having a rare opportunity to relax, I love giving the gift of movie night to others. In fact, whether giving a gift for the holidays, a birthday, bridal shower, or whatever the occasion maybe; I love giving a gift that is activity and has a personal touch. See for me, an ideal gift is the opportunity to spend time and go do something memorable with a friend or loved one. So I strive to gift personalized gifts like this, and always include a special homemade treat, whenever the occasion calls! 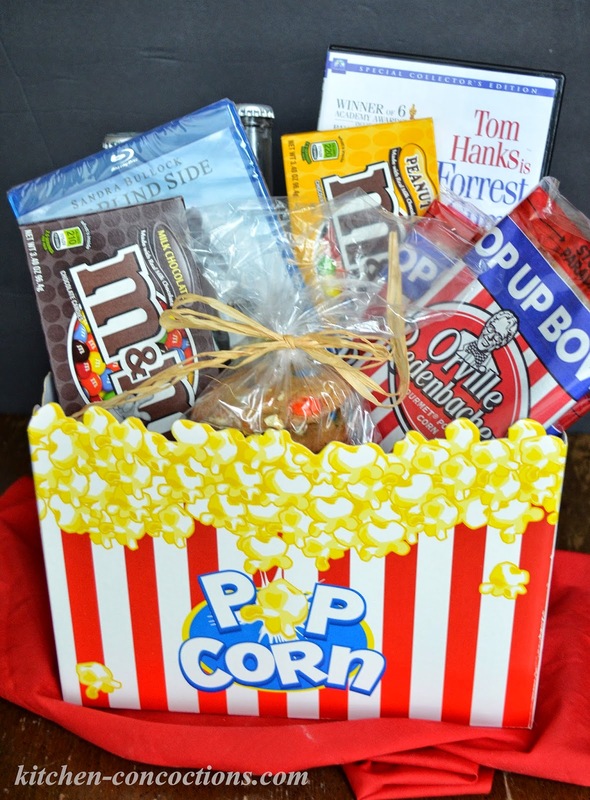 My movie night gift baskets have become quite popular among my friends and family. This gift is super fun, yet thoughtful, and easy to put together. It is also super affordable since all of the gift items can be purchased conveniently at my local Walmart. 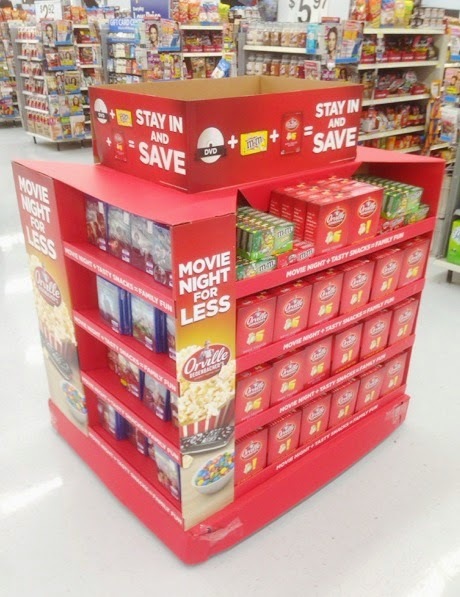 Right now Wallmart is making it even easier and more affordable to give the gift of movie night this holiday season, with these special move night pallets with almost everything you need (including Orville Redenbacher’s, M&M’s® and a variety of Warner Brothers DVD and Blu Ray movies) in one easy location. Since I have some good friends who just had a baby (which means they aren’t getting out much right now), I thought surprising them with a movie night gift basket was just the thing they needed to have movie night in the comfort of their own home. 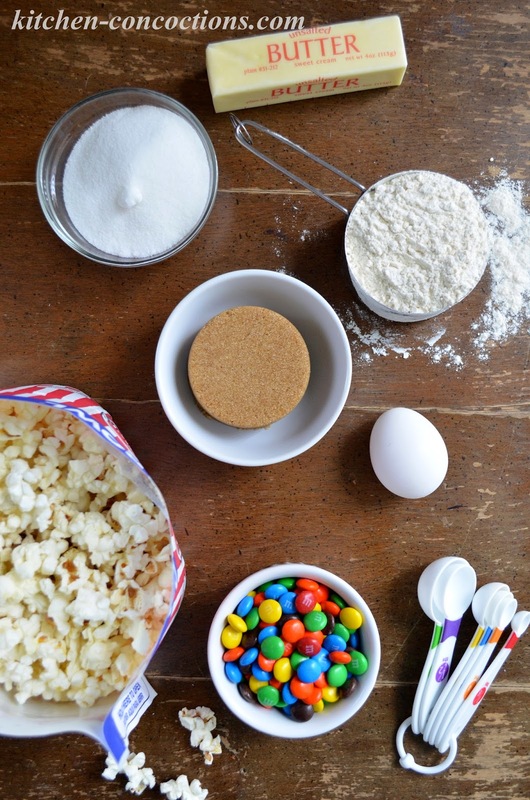 In addition to giving gifts that are an activity, I always like to include a homemade treat. I have found that including a homemade treat (no matter what type of gift I give) adds an extra special personal touch and makes the gift recipient feel more loved and remembered. 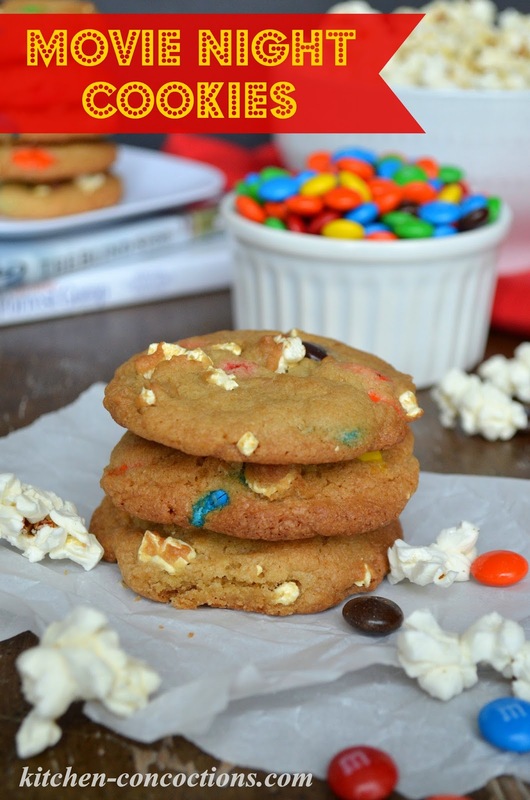 Buttery, crispy cookies filled with favorite movie night snacks: popcorn and M&M’s®! In a large bowl, using a hand-held mixer or stand mixer with a paddle attachment, cream together the butter and both sugars on medium speed, until light and fluffy. Mix in eggs, one at a time, mixing well after each addition and scraping the sides of the bowl as needed. Add vanilla extract and mix well. In a separate bowl, stir together the flour, baking soda and salt. Slowly add the flour mixture, a little at a time, to the butter mixture, mixing just until combined. 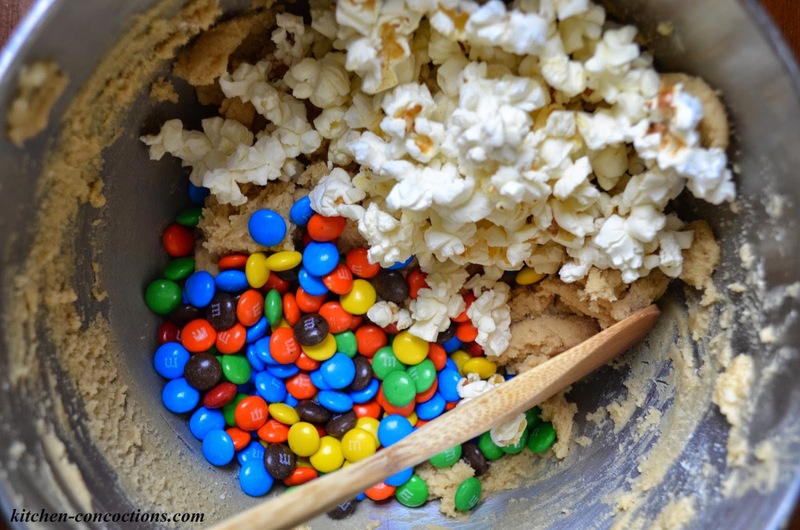 Carefully, fold in prepared popcorn and 1 cup M&M’s® chocolate candies. Drop dough, by rounded tablespoonfuls, 2 inches apart onto a baking sheet. 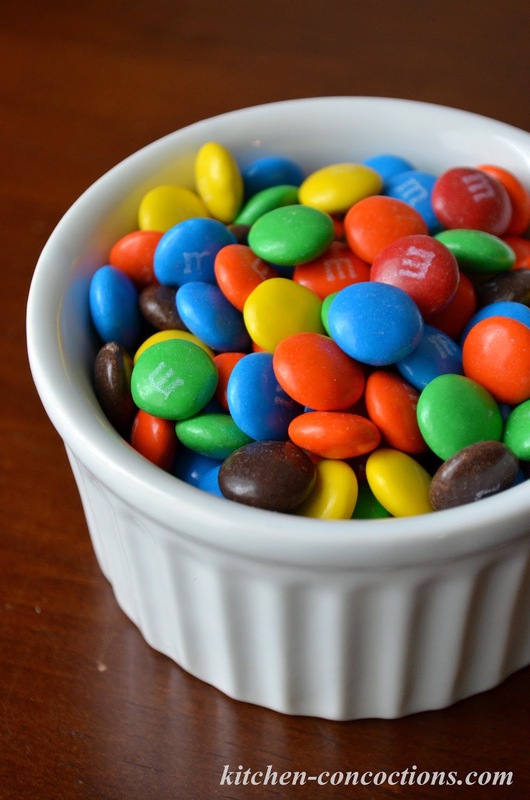 Press 3-4 of the remaining M&M’s® on top of each cookie. Bake for 10-12 minutes, or until cookies are lightly browned, set in the middle and crispy around the edges. Let the cookies cool on the baking sheet for 5-8 minutes before moving to a cooling rack to cool completely.